You’ll find our contemporary Tea Brewery in the heart of Alnwick’s Castle Quarter in Northumberland. A calm, relaxing environment for a perfect cup of tea, we’re an antidote to those faceless American coffee conglomerates. We’re open from 11am – 4pm every day during school holidays, and Thurs – Mon (closed Tues & Weds) during term time, serving a choice of over 30 loose leaf teas, freshly made scones and cake. Soup is served 12-2pm, with tea and treats served all day until last orders at 3.30pm. We move to Term Time opening hours from Monday 22nd Apr ie closed Tuesdays & Wednesdays. You can find our latest menu below. Come and join us for a relaxing cuppa with the paper, try one of our more unusual teas, bring your mother in law for a scone or book for lunch with the lasses. We can promise good, unfussy, honest food with great service, and some of the best teas from around the world. (Sorry, we don’t do noisy Italian coffee). 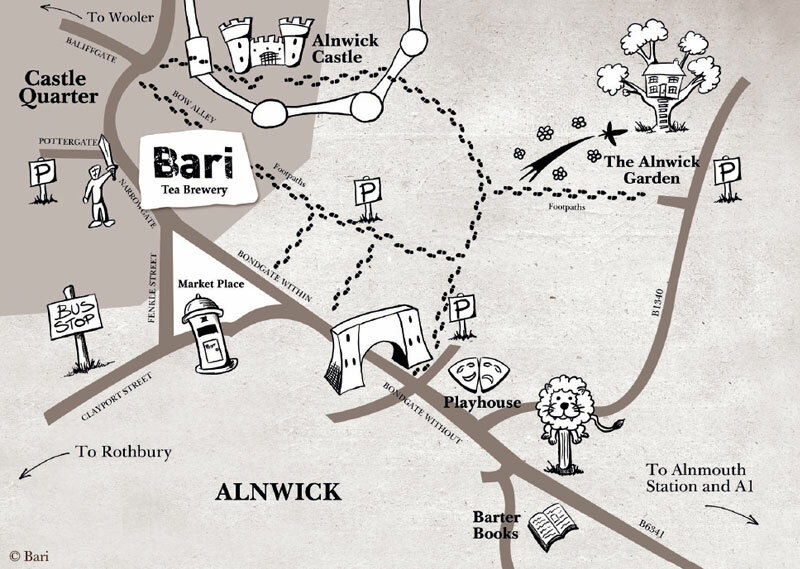 New to Alnwick? Here’s a handy map so you can find our Tea Brewery. There is off street car parking within easy walking distance. Our nearest train station is Alnmouth (for Alnwick) with hourly connecting buses or local taxis. Alnwick bus station is less than 5 mins walk away, where Market Street meets Clayport Street. Level access into the Tea Brewery makes it easy to negotiate by wheelchair. We have an accessible bathroom, but please be aware that there is not enough room for a wheelchair to three-point turn or to parallel park against the toilet. Please give us a call if you have any queries re accessibility or if there is anything we can do to make your visit even more enjoyable. We have sample jars displaying all our teas, ideal for our visually impared guests. The Bari Tea Brewery has free Tea-WiFi(e) available. Just ask for our password. We can provide a high chair and have baby-changing facilities for our very young visitors. We have over 30 house teas, plus occasional guest teas. You can see, touch and smell all our teas in the taster jars on the wall. Bari teas are available to drink-in, take away or buy loose leaf. We’re happy to advise on which teas we think would go best with your food – just ask one of the Bari lads or lasses. Homemade Scones £2.50 Variety of flavours, some unique to Bari, baked each day on the premises by Caroline, Iz or Pam. Served with butter – fruit scones with butter and jam. For an extra 50p, add some Northumbrian cream with your scone or try Lynette’s Red Onion Marmalade with a savoury scone. Please ask about our bari cakes, fresh and locally made by our friends at the Running Fox Bakery. Bit o’ Crumpet £2.75 Two crumpets with butter, and some honey or jam on the side. Bari High Tea for Two £12.50 for two sharing Choose two scones, with a pot of tea for two. Sweet scones (e.g. fruit) served with Northumbrian cream and jam; savoury scones (e.g. cheese) with butter and Lynette’s Red Onion Marmalade. Also served with fruit skewers. Homemade Soup £5.00 Made in-house and served with a wodge of Northumberland stottie bread. Soup and Scone Clashe £5.50 Our homemade soup with one of our fresh scones of your choice instead of bread. Bairn’s Soup £2.75 A half portion served with buttered stottie– for our guests aged up to 5 years. Keep your eye out for our occasional ’Lotti Soup – made with whatever’s been pulled from the allotment that week. Our allotment soil is fed with compost we make in the Tea Brewery’s back yard from our vegetable waste and your spent tea & coffee. We try to have non-wheat products such as cakes and rolls available. Please ask if you require gluten-free bait. Our no-wheat products are made and prepared in areas where wheat products are also prepared. We cannot guarantee our products are nut-free. Wherever practical, we try and source local products, but this sometimes makes for changeable availability. Please ask to speak to the Duty Maître t’ if you have a food allergy you think we should be aware of, or if you would like details about the ingredients we use. Parked in a short-stay car park? Haven’t quite wound down to the Alnwick pace of life yet? We’d love it if you visited Trip Advisor.